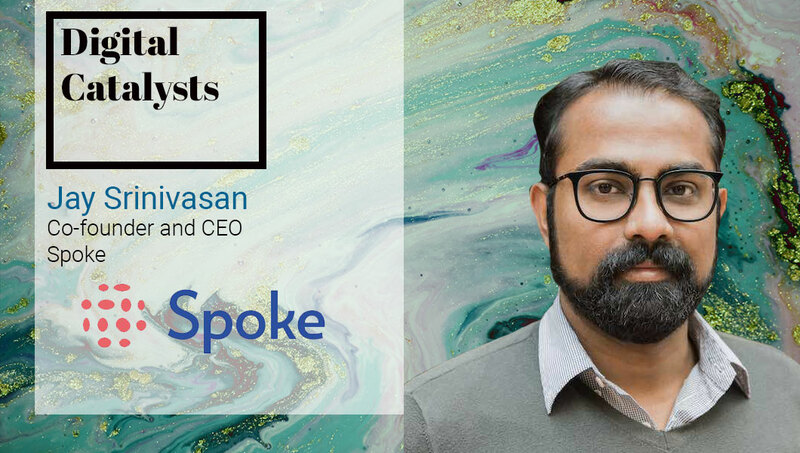 Jay Srinivasan: I am the Co-Founder and CEO of Spoke. Spoke gives workplaces an efficient way to deal with employee requests. I founded Spoke along with fellow Google alums David Kaneda and Pratyus Patnaik in 2016. Previously we started Appurify, which we then sold to Google. We founded Spoke to build a software experience that gives employees access to the knowledge and services in their organization, on-demand. Jay Srinivasan: Our lives today are flooded with on-demand apps that bring goods and services to our fingertips — whether it’s grocery shopping, absorbing content, getting a ride; you name it, there’s an app making it faster by eliminating inefficiencies. Spoke is bringing that philosophy to the workplace. A common complaint is that IT departments and IT service desks are swamped with repetitive requests. Instead of tackling broader and more significant issues, these departments are bogged down with the monotonous task of answering all those repetitious questions. Often, there’s a backlog of requests. And when that happens, employees become impatient, frustrated, and less productive. Outdated ticketing systems are clearly not working. But what can replace it? We have made an AI-powered chatbot that learns and adapts to each workplace. We just put together a fascinating report which shows that Spoke helps companies answer 29.2 of questions automatically. Support teams therefore have extra time to help their co-workers on a human level. When it comes down to it, what sets us apart is that this product was built for chat-based communication tools in mind. Employees can now use Slack for most of their workplace needs, whether it’s setting up a meeting, giving feedback, or seeking out help. In the same report we found that when given the ability by Spoke, employees make 70% of their tickets in Slack, which is super interesting. Jay Srinivasan: Our software is ideal for any department answering employee questions on a daily basis. These tend to be HR and IT departments feeling overwhelmed with requests, but within an org CS, Marketing and Ops teams use it frequently as well. We have seen that there’s a great diversity of sectors eager to provide on-demand workplace software to their teams. Jay Srinivasan: Large sections of the organization need to use us, and they want to. But it’s always difficult to come in and change the way people do things with new software, especially with legacy ticketing systems out there. We work best with forward-thinking companies like AllBirds, StockX, Doordash and others who want to give their employees the best user experiences. Another challenge we are seeing from our customers is that there’s this whole new generation that expects their workplace technology to be as seamless and efficient as Uber and Postmates. Companies are trying to find a way to cater to that audience while also keeping in mind that workplace technology might have to do more complex tasks. We’re happy to guide companies through that transition. Jay Srinivasan: We help our clients make that important shift in mindset by Providing readily available information and guiding them through the implementation process. Employees are expecting the on-demand workplace more and more. There’s also this misconception that automation means eliminating someone’s job. That isn’t what we are doing. We are giving people who are overwhelmed at their job more time to make human connections with co-workers. Jay Srinivasan: We have helped a variety of companies, ranging from startups that are dealing with the issues that come with expansion to larger scale corporations who want to transform their ticketing system. StockX is growing at warp speed and they’ve used us as they’ve scaled from 200 to 600 employees in a year. They report back that with Spoke, they’re able to auto-respond to 35% of all requests across the organization. That’s great savings of time and human resources. Jay Srinivasan: Enterprise digital transformation will come from more technologies that allow teams to offload inconvenient work. People are used to on-demand service in the consumer world and employees are bringing those expectations to their devices at work. Jay Srinivasan: I often recommend Behind the Cloud, The Untold Story of How Salesforce.com Went from an Idea to a Billion Dollar Company – And Revolutionized an Industry. It’s about the early days of the cloud and how Salesforce learned to harness it. I see a lot of parallels today with where we are in the on-demand workplace.